Ph. D., Queen Mary, University of London, in collaboration with Bell Labs, 2000-2003. Thesis title: Self-Organising Algorithms for Wireless Networks and its Analysis Using Complexity Metrics. B. Eng, Queen Mary, University of London, 1996-1998. 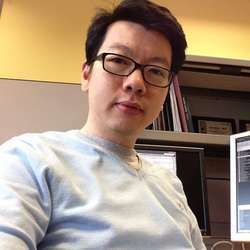 Lester Ho is a Distinguished Member of Technical Staff in the Small Cells Research team at Bell Laboratories, Alcatel-Lucent, Dublin, Ireland. He studied at Queen Mary, University of London, where he received a B.Eng. in electronic engineering in 1998 and a Ph.D. on the topic of self-organizing behavior in wireless networks in 2003. Lester joined Bell Labs UK in 2003 and has worked on various topics including the auto-configuration and dynamic optimization in wireless networks, protocols and algorithms for flat cellular network architectures, techno-economic modeling of future wireless business models and applying machine learning in autonomous networks. His current research interests are in the area of small cell networks, particularly in the areas of self-optimization, interference management in co-channel het-nets, metrocell and femtocell deployment strategies, energy efficiency, and ultra-dense cells. S. Kucera, L.T.W. Ho, R.Razavi, H. Claussen, “Coverage Optimization Tradeoffs in Heterogeneous W-CDMA Networks with Co-Channel Small Cells,” in Proc. IEEE Global Communications Conference (Globecom’13), Atlanta, Dec. 2013. L.T.W. Ho, H. Claussen, D. Cherubini, “Online Evolution of Femtocell Coverage Algorithms Using Genetic Programming,” in Proc. IEEE Personal, Indoor and Mobile Radio Communications Symposium (PIMRC’13), London, Sept. 2013. D. Lopez-Perez, H. Claussen, L.T.W. Ho, “Improved Frequency Reuse Schemes with Horizontal Sector Offset for LTE,” in Proc. IEEE Personal, Indoor and Mobile Radio Communications Symposium (PIMRC’13), London, Sept. 2013. H. Claussen, L.T.W. Ho, “Multi-carrier Cell Structures with Vertical and Horizontal Sector Offset using Static Beamforming,” in Proc. IEEE Personal, Indoor and Mobile Radio Communications Symposium (PIMRC’13), London, Sept. 2013. H. Claussen, L.T.W. Ho, F. Pivit, L.G. Samuel, “Femtocell Coverage Optimization,” book chapter in in Small Cell Networks: Deployment, PHY Techniques and Resource Management, T. Quek, G. de la Roche, I. Guvenc, M. Kountouris, Eds. Cambridge University Press, July 2013. H. Claussen, L.T.W. Ho, “Multi-carrier Cell Structures with Offset Sectorization for Heterogeneous Networks,” in Proc. IEEE International Conference on Communications (ICC’13), Budapest, June 2013. E. Hemberg, L.T.W. Ho, M. O’Neill, H. Claussen, “A Comparison of Grammatical Genetic Programming Grammars for Controlling Femtocell Network Coverage,” Genetic Programming and Evolvable Machines, vol. 14, no. 1, pp. 65-93, March 2013. L.T.W. Ho, I. Ashraf, F. Boccardi, “Sleep mode techniques for small cell deployments,” IEEE Communications Magazine, vol.4, no.8, pp. 72-79, August 2011. E.Hemberg, L.T.W. Ho, M. O’Neill, H. Claussen, “Symbolic Regression Approach to Manage Femtocell Coverage Using Grammatical Genetic Programming,” in Proc. ACM Genetic and Evolutionary Computation Conference (GECCO), Dublin, July 2011. D. Aziz, A. Ambrosy, L.T.W. Ho, L. Ewe, M. Gruber, H. Bakker, “Autonomous Neighbour Relation Detection and Handover Optimization in LTE,” Bell Labs Technical Journal, Special Issue on SON, Fall 2010. I. Ashraf, H. Claussen, L.T.W. Ho, “Distributed Radio Coverage Optimization in Enterprise Femtocell Networks,” in Proc. IEEE International Conference on Communications (ICC’10), Cape Town, May 2010. I. Ashraf, L.T.W. Ho, H. Claussen, “Improving Energy Efficiency of Femtocell Base Stations via User Activity Detection,” in Proc. IEEE Wireless Communications and Networking Conference (WCNC’10), Sydney, April 2010. H. Claussen, I. Ashraf, L.T.W. Ho, “Dynamic idle mode procedures for femtocells,” accepted for publication, Bell Labs Technical Journal, Special Issue on Eco-Sustainability and Green ICT, vol. 15, no. 2, pp. 95-116, Sept 2010. I. Ashraf, L.T.W. Ho, F. Boccardi, “Power savings in small cell deployments via sleep mode techniques,” in Proc. IEEE Personal, Indoor and Mobile Radio Communications Symposium (PIMRC’10), Istanbul, Oct 2009. H.Claussen, F.Pivit, L.T.W.Ho, “Self-optimization of femtocell coverage to minimize the increase in core network mobility signalling,” Bell Labs Technical Journal, vol.14, no.2, pp.155-184, 2009. L.T.W. Ho, I. Ashraf, H. Claussen, “Evolving femtocell coverage optimization algorithms using Genetic Programming,” in Proc. 20th IEEE Personal Indoor and Mobile Radio Communications Symposium (PIMRC’09), Tokyo, Sept. 2009. H. Claussen, L.T.W. Ho, L.G. Samuel, “Self-optimization of coverage for femtocell deployments,” in Proc. Wireless Telecommunications Symposium (WTS 2008), Pomona, USA, April 2008. H. Claussen, L.T.W. Ho, F. Pivit, "Effects of joint Macrocell and Residential Picocell Deployment on the Network Energy Efficiency," in Proc. IEEE International Symposium on Personal, Indoor and Mobile Radio Communications (PIMRC’08), Cannes, September 2008. H. Claussen, L.T.W. Ho, F. Pivit, “Leveraging advances in mobile broadband technology to improve environmental sustainability,” Telecommunications Journal of Australia, vol. 59, no. 1, Feb 2009. Winner of the 2008 Eckermann-TJA Prize. H. Claussen, L.T.W. Ho, L.G. Samuel, “An overview of the femtocell concept,” Bell Labs Technical Journal, vol.13, no.1, Spring 2008. L.T.W. Ho, H. Claussen, “Effects Of User-Deployed, Co-Channel Femtocells On The Call Drop Probability In A Residential Scenario,” in Proc. IEEE Symposium on Personal, Indoor and Mobile Radio Communications (PIMRC’07), Athens, September 2007. H. Claussen, L.T.W. Ho, “Financial Analysis of a Pico-Cellular Home Network Deployment,” in Proc. IEEE International Conference on Communications (ICC’07), Glasgow, 24 June 2007. L.T.W. Ho, J. Markendahl, M. Berg, “Business aspects of advertising and discovery concepts in Ambient Networks,” in Proc. IEEE International Symposium on Personal, Indoor and Mobile Radio Communications (PIMRC’06), Helsinki, September 2006. H. Karimi, L.T.W. Ho, H. Claussen, L.G. Samuel, “Evolution towards dynamic spectrum sharing in mobile communications (Invited Paper),” in Proc. IEEE International Symposium on Personal, Indoor and Mobile Radio Communications (PIMRC’06), Helsinki, 11-14 September 2006. H. Claussen, L.T.W. Ho, H.R. Karimi, F.J. Mullany, L.G. Samuel, “I Base station- Cognisant robots and future wireless access networks,” to appear in Proc. of IEEE Consumer Communications and Networking Conference (CCNC’06), Las Vegas, USA, Jan 2006. L.T.W. Ho, F.J. Mullany, H. Claussen, L.G. Samuel, “Autonomous organization of wireless network transport in a multi-provider environment (Invited Paper),” Proc. of IEEE International Symposium on Autonomous Decentralized Systems (ISADS’05), pp. 719-724, Chengdu, China, April 2005. F.J. Mullany, L.T.W. Ho, L.G. Samuel, H. Claussen, “Self-deployment, self-configuration: critical future paradigms for wireless access networks,” First International IFIP Workshop on Autonomic Communications, Revised Selected Papers, Lecture Notes in Computer Science 3457, Springer Verlag, pp.58-68, October 2004. L.T.W Ho, J.M. Pitts, L.G. Samuel, “A self-organising channel allocation algorithm: implementation and evaluation using complexity metrics,” Proc. of International Working Conference On Performance Modelling And Evaluation Of Heterogeneous Networks (Het-Net’03), Ilkley, UK, July 2003. L.T.W Ho, J.M. Pitts, L.G. Samuel, “Applying emergent self-organizing behaviour for the coordination of 4G networks using complexity metrics,” Bell Labs Technical Journal, vol.8, no.1. pp.5-26, Spring 2003. L.T.W Ho, J.M. Pitts, L.G. Samuel, “Decentralised cell dimensioning in 4G networks: analysing self-organising behaviour using complexity metrics,” Proc. of 18th World Telecommunications Congress (WTC’02), Paris, France, September 2002. L.T.W Ho, J.M. Pitts, L.G. Samuel, “Invoking emergent self-organising behaviour for network auto-configuration,” Proc. of the 6th Wireless World Research Forum, London, UK, June 2002. L.T.W. Ho, J.M. Pitts, L.G. Samuel, J.A. Schormans, “Buffering packetised data: an examination of the crossover effect,” IEE Electronics Letters, vol. 34, no. 17, August 1998. Lester has over 25+ patents granted.